Jan 16 (AZINS) Four of the five nuns, who back their colleague who alleged she had been raped by Bishop Franco Mulakkal, have been asked to leave the Kuravilangad convent immediately by the management of the Missionaries of Jesus congregation. They have been asked to join other convents of the congregation in other parts of the country, and been asked to 'forgive individual shortcomings of the past'. The four nuns who have been asked to leave the Kuravilangad convent are Sister Alphy Pallasseril, Sister Anupama Kelamangalathuveliyil, Sister Josephine Villoonnickal, and Sister Ancitta Urumbil. The only nun who has not been given marching orders so far is Sister Nina Rose, The News Minute reported. These five have stood firm in support of the nun who alleged that she had been raped by Bishop Mulakkal, against growing pressure from within their own organisation. 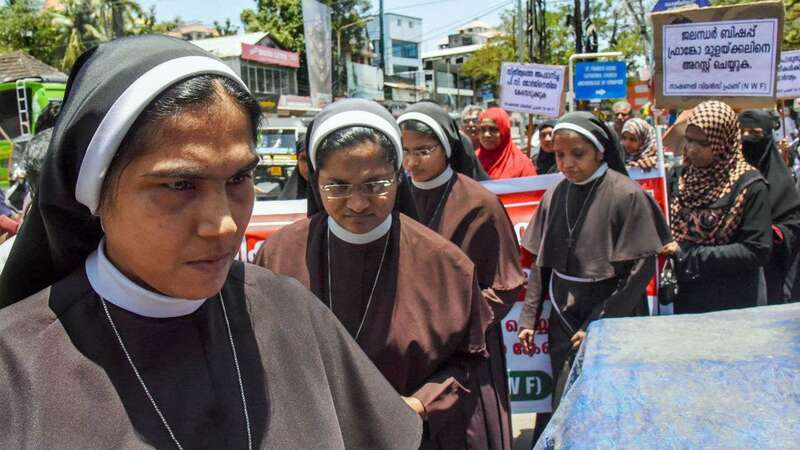 Reports said the four nuns had received letters from Superior General Regina Kadamthottu asking them not to make the legal proceedings "an alibi to compromise" the religious values of the Missionaries of Jesus congregation. The letter asked the nuns to report at convents spread out across the country while saying the congregation would in no way interfere in their attempts to carry forward with their legal actions. Sister Alphy and Sister Josephine had been transferred to Missionaries of Jesus's centres in Bihar's Pakartala and Jharkhand's Lalmatia respectively in May 2017, but they had returned to support the survivor and refuse to go back. Sister Anupama and Sister Ancitta had been transferred to Punjab's Chamiyari and Kerala's Pariyaram respectively in May 2018, at the height of the controversy. The nuns have stood in support of one of their colleagues who alleged that Mulakkal had raped her multiple times on his visits to Kuravilangad. He was the bishop of the Roman Catholic Diocese of Jalandhar when the accusations emerged. He and his organisation also stand accused of trying to suppress the issue and putting pressure on the nuns to not go ahead with legal actions. "Accusations sans truth have been flying thick and fast in the public realm about the 'lack of concern the MJ Congregation was showing to the nuns who are standing for justice'. Even as you and a few other MJ members continue to have no qualms in issuing malafied (sic) public statements and circulate baseless stories," read the letters sent to the four transferred nuns. "… may I exhort you to rise above personal differences among members and forgive individual shortcomings of the past to strengthen the Congregation as befitting God's children," the letter says towards the end.